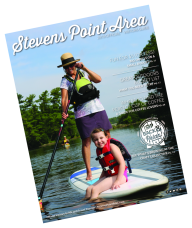 Learn about what the Stevens Point Area has to offer. Nestled in the center of Wisconsin, at the crossroads of Highway 10 and Interstate 39, it is a fun place to visit and a wonderful place to live. Covering more than 800 square miles in Central Wisconsin, most of Portage County is rural offering year-round recreational opportunities, dotted with small communities. When Stevens Point was first founded in 1858, the logging industry and trading posts defined the location. With help from the Wisconsin River, the railroad, and rich soil, the area continued to prosper. Now, the region is home to 27 municipalities with a population of over 70,000. Find the link between history and industry in the Stevens Point Area by visiting popular attractions. Get a taste for the area by visiting the Stevens Point Brewery, one of the oldest continually operating breweries in the nation, or one of the other several craft breweries, wineries or distillery that call the area home. Explore the local food scene, the state’s longest-running farmers market, and the many unique local shops. Learn why the SentryWorld Golf Course, ranked as one of Wisconsin’s top courses, is known for its signature Flower hole or what wildlife watching means on the Wisconsin River Golf Course. If your swing isn’t up to par, try your hand at one of our many disc golf courses. Visit the Renew the Earth Center, headquarters for the Midwest Renewable Energy Association, hosting the world’s largest and longest running renewable energy event each June. Don’t forget about your four legged friends, as you explore the region’s two large dog parks. Explore the best views in the county on foot or by bike and follow the Green Circle Trail, a 27-mile trail that circles the city of Stevens Point winding along the Wisconsin River, Little Plover River and other tributaries. The trailhead for the Green Circle Trail is located in the Schmeeckle Reserve, a 280-acre nature preserve on the University of Wisconsin – Stevens Point campus. Hike or bike the Ice Age Trail and wind through the hills and valleys once shaped by glaciers. More glacial trails framed by woods and wildlife are available at Standing Rocks County Park. Or take a journey down a once abandoned railroad bed, by foot, bike or horseback, where the 18-mile Tomorrow River State Trail brings the county’s history and natural beauty to the forefront. Birding is also varied and plentiful in Portage County. As part of the Central Sands Prairie Region of the Great Wisconsin Birding & Nature Trail, the area offers the Buena Vista Grasslands, Dewey Marsh State Natural Area, Iverson Park, Richard A. Hemp State Fishery Area, Schmeeckle Reserve, and the George W. Mead Wildlife Area. Rest your legs and venture out on one of the many waterways in Portage County. More than 40 lakes, an array of rivers, streams, and flowages offer an opportunity to fish, kayak, canoe and swim. County parks offer ample recreational choices. Inspired by the beauty of the area, arts are an integral part of Portage County. Reflected in the art of Portage County residents, it is woven into the architecture and lifestyles of each community. Discover the arts and culture scene of the region, from the Stevens Point Sculpture Park, live performances and diverse art galleries.